PITD Associate Director Ms. H. Gingerlei Porter (2nd from left) and ET NWS WSO Pago Pago, Mr. Marcus Langkilde (right end) with crew of NOAA’s Gulfsteam G-IV, nicknamed #Gonzo (#NOAA49) including Lt. Cmdr. Rebecca Waddington and Capt. Kristie Twining (4th and 5th from left). Porter says she is fortunate to have had such an opportunity to visit and learn about the mission of the NOAA49 in American Samoa and the Pacific, to identify collective efforts for training but especially to learn from women who are trendsetters in the sciences. Capt. Kristie Twining and Lt. Cmdr. Rebecca Waddington were NOAA’s first all-female crew to pilot for NOAA when they flew into Hurricane Hector in August 2018. 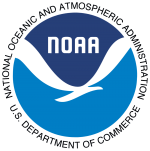 NOAA has 39 pilots and only five are women.